Mother's Day is this Sunday and run-of-the-mill gift choices are loaded up in all their glory on store shelves right now. That's really not so surprising considering that after Christmas, Mother's Day is probably the second most popular day of the year for present giving, not to mention long distance "I love you call" making to Moms everywhere. Maybe last year you adult sons and daughters sent your moms some flowers or your own young kids might have made something by hand for you at school. This season, dare to be different and possibly more sentimental, too. Why not give something this Mother's Day that can truly bridge the generations, can be enjoyed thousands of miles away -- no matter the time zone, and also may be used the other 364 days on the calendar? The answer to that riddle is something my own Mom will be receiving this weekend: a CEIVA Pro80 Digital Frame that comes bundled with a year's worth a picture delivery service. This CEIVA product was selected in 2009 for the Most Memorable Gifts for Hanukkah and for the Best Christmas Presents Showcase. 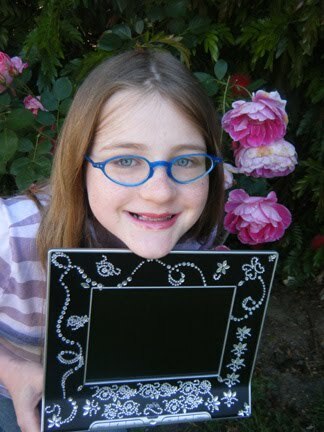 Pictured here is my 12 year-old daughter who sometimes guest blogs here as Mini MommyBlogExpert proudly showing off the frame she blinged out with the sparkling stick-on crystals that CEIVA sent us along with this frame for review. 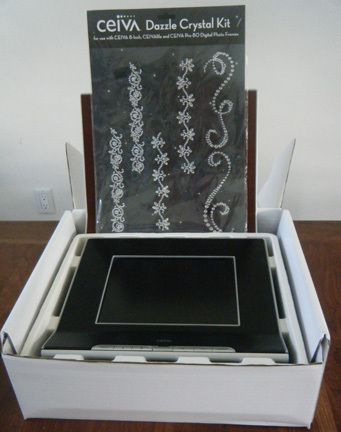 Above is a photo showing the product and package of crystals still in its box when they arrived, before she decorated the frame. Don't worry, this post may be going up days before the holiday but there's just about a zero percent chance Grandma is even going to find out about it before it arrives on her doorstep because she's never read my blog. It's not that my Mom isn't interested in her daughter's writing -- it is because she has never had nor ever wants to use a computer. With CEIVA's Pro80 purchase options available as 1, 2 or 3 digital frames packaged with an equal number of one year picture delivery plans included, there is even the possibility to send frames to BOTH sets of your kids' grandparents or even to more relatives living some distance from one another. 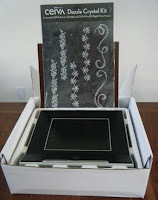 As of the date this post was published, a Mother's Day sale currently being offered includes one CEIVA Pro80 Digital Frame for $147.99, including a one year picture plan -- together regularly priced at more than $200) plus a free gift of a dazzle crystal kit valued at $19.95. CEIVA Pro80 MultiPacks are on sale as well, with two and three frames currently priced respectively at $269.99 and $359.99. At a small additional cost, you can personalize these frames in a myriad of ways still further, with more than one thousand skins and a variety of other frame, matte, and finish options such as these. The CEIVA Pro80 Digital Frame as well as other digital frames and accessories are all available directly from the manufacturer's online store. Select CEIVA products and accessories may also be purchased from retailers such as Best Buy, Solid Signal, Amazon, Helix Camera & Video, and Samy's Camera. WIN a CEIVA Pro80 Digital Frame including one year picture plan service, together valued at more than $200. Winner must be a legal resident of the U.S. to win and there is a limit of one main entry per person; extra entries are limited to one of each type. HURRY, Contest ends at 11:59 pm PDT on May 20, 2010. FTC Disclosure: MommyBlogExpert received the CEIVA Pro80 Digital Frame as well as the dazzle crystal kit from the manufacturer for this review. For this MommyBlogExpert giveaway contest an additional Pro80 Digital Frame is being provided by CEIVA to be given away to one lucky contest winner. MommyBlogExpert did not receive any payment or other compensation associated with this post or giveaway contest. See complete FTC Disclosure information that appears at the bottom of MommyBlogExpert's main page and at the bottom of every individual post on this blog, including this one. I’m following Ceiva on Twitter as tetheredmommy. This would be amazing to win! I have so many pictures of my son that I could put in it. have a great one ! I would so much love to win this prize! I have such a big family, having frames all over every where has become a health hazard! LOL Not only is it very practical, it is, as your daughter very beautiful! Add to all that is the easy to use factor and what could be better to keep family photos visible when the family isn't near by? Love it! Pick me! I always buy these type of frames for others and I want one! Excellent info. Thanks for the post. The amount of fresh quality content on this particular website has certainly made me realize the huge authority your site carries. Fantastic posts and articles in every corner. Keep it going. Aw, this was a really nice post. In idea I would like to put in writing like this additionally – taking time and actual effort to make a very good article… but what can I say… I procrastinate a lot and by no means seem to get something done. Knowing exactly how much I could spend, on average, per day was very satisfying because it's a real number that you can keep in mind on a daily basis. Thank you for your post, I look for such article along time, today I find it finally. this post give me lots of information it is very useful for me . Great post! I was passing by here and I read your post. Its quite interesting. I will look around for more such post. Thanks for sharing. This is a really interesting site and it has a lot of helpful information posted here. Thanks for all your hard work. This information is really useful and definetely is comment worthy! I’ll see if I can try to use some of this information for my own blog. Thanks! I like it very much, I will come next time, thank you for your service and I am satisfied with it. Very inspiring post! It's very informative, thanks a lot. Hi! I just want to tell you that I found this blog really useful to me. I will visit this blog regularly to read more. Thanks. Excellent post! I look forward to reading more from you in the future. nice blog with some good topics covered thanks for posting. Thank you for sharing with us. I love this style blog very much. I sincerely say you come up with some superb points and I will submit a number of thoughts to add to briefly. This is a perfect post. I like your writing style. Will look around your website. Looks like a resourceful website! Thanks for sharing.